Using a food processor, coarsely chop the salmon; transfer to a bowl. Mix in the capers, lemon peel, parsley and seafood seasoning and season with salt and pepper. Form into four patties. In a nonstick skillet, heat the EVOO, one turn around the pan, over medium-high heat. Add the patties and cook for 4 minutes on each side. Meanwhile, in a small bowl, combine the cucumber, tomatoes and red onion. In another small bowl, mix the mustard with the dill. Toast the rolls under the broiler and slather each side with the mustard-dill sauce. Squeeze the lemon half over the cooked burgers. Set a lettuce leaf and burger on each roll bottom and top with tomato-cucumber relish and a roll top. In Recipes-list.com we have selected the most viewed recipes from category - uncategorized . Enjoy the best recipes specially selected for you! 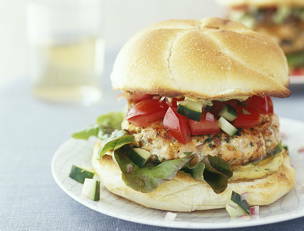 Salmon Burgers with Dill Mustard is the right choice that will satisfy all your claims.